The solid fuel stove and portable electric heaters provides the heating for the property. 2 small dogs welcome. 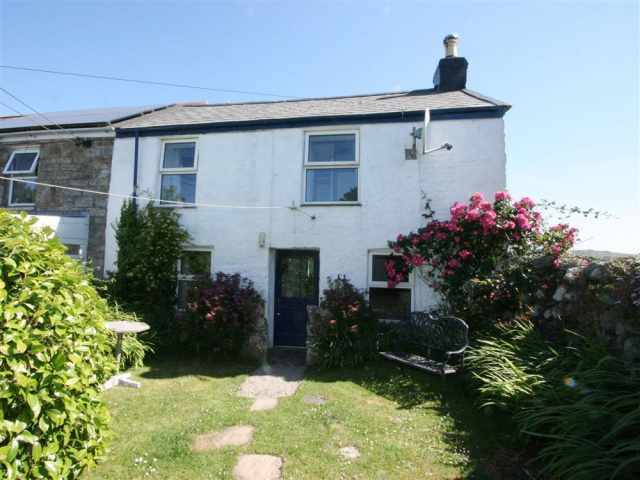 Only three miles from the beautiful beach at Porthcurno, also home to the renowned open-air Minack Theatre, this traditional grade II listed terraced cottage is set in the quiet village of St Buryan with the village pub and general store/P.O. only a two minute walk away. Offering the perfect base for couples wishing to explore the West, the golden sands at Sennen, Lands End, Lamorna Cove, Mousehole and Penzance are all within a 5 mile radius, and St Ives is also within easy reach. The dramatic South West Coast Path has stunning views across the sea and a scenic circular bus route follows the coastal road around West Penwith. There is also a ferry service from Penzance to the Isles of Scilly and light aircraft operating a daily service from Land's End to St Mary's as well as scenic flights over West Cornwall. Approached through a little walled and gated patio garden, the front door opens to an entrance porch with coat pegs and an inner door leads directly into a warm and cosy sitting/dining room with a painted beamed ceiling and a large granite hearth housing the solid fuel stove. Beyond the living room, a short hallway gives access to a neatly fitted kitchen with rustic pine units and a low doorway, and a back door opens to the sheltered rear garden with seating on the gravel terrace. A rather steep and narrow carpeted staircase leads up to a small landing, a bathroom W.C. with hand basin, heated towel rail and shower over the bath and a pine furnished double bedroom with scatter rugs on the rustic wood floorboards, some exposed granite stone and wooden shutters across the double glazed windows. There is unrestricted roadside parking outside the cottage.